Today I went out for karaoke with Ah Max and friends. After that, we went for dinner at Top Spice Korean BBQ, again. The lovely couple Ah Max and Soo Yin. First time meeting the two ladies. Nice and funny people. Top Spice has a new menu! Then we saw this “Friends Set” which is just nice for 4 of us. So we ordered it. It comes with BBQ pork ribs. Delicious as usual. And also all the vege to eat together with the meats. And the pork belly roll salad. Not bad, but can hardly taste the pork belly. Too thin I guess, mostly vege only. First time having the kimchi soup. Very nice. First time having the tofu soup with lots of seafood as well. Although it looks a bit bloody and hot, but it wasn’t that spicy actually. Taste nicer than I thought. 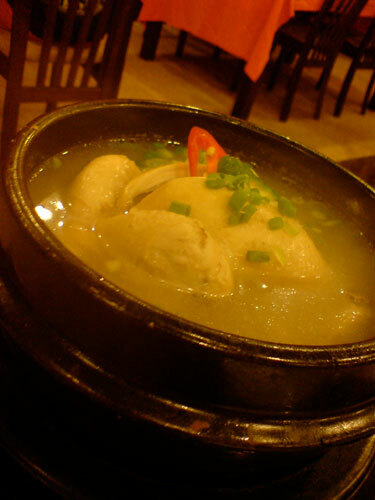 And also the ginseng chicken soup. It doesn’t really have the strong herbs taste. The chicken was very tender and it has some porridge at the bottom. It was really nice. And the seafood pancake. Taste not bad when eat together with the sauce they provide. And as usual, Korean BBQ always comes with so many side dishes that makes you wonder which one you should eat first. The set comes with so many food we can hardly finish everything. But still, we managed to stuff everything into our stomach. The menu suggests for 3 to 4 persons but personally, I would suggest for 4 to 5 persons. The boss is really a nice person. He said I was the first person to post the review about their restaurant on the Internet long time ago. Besides, since I visit the restaurant so frequently, he gave me 5% discount. And the best part is, the boss has given me a special privilege. Whenever I go to dine at the restaurant, I will get 5% discount! So who wants to buy me dinner? walauwei…. so fast adi post jor.. yer………….!!!!! faster than me geh..
ish…………. but when i go, i stil dun1 bring u go..
hi dennis! you made a right choice for the Korean menu!